This article proposes an agent-oriented methodology called MAS-CommonKADS and develops a case study. This methodology extends the knowledge engineering methodology CommonKADS with techniques from objectoriented and protocol engineering methodologies. 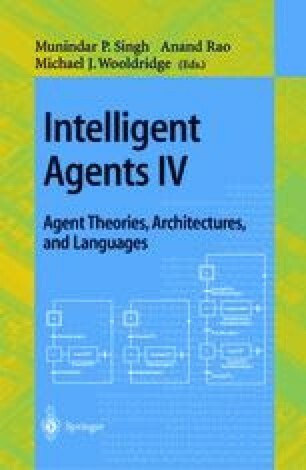 The methodology consists of the development of seven models: Agent Model, that describes the characteristics of each agent; Task Model, that describes the tasks that the agents carry out; Expertise Model, that describes the knowledge needed by the agents to achieve their goals; Organisation Model, that describes the structural relationships between agents (software agents and/or human agents); Coordination Model, that describes the dynamic relationships between software agents; Communication Model, that describes the dynamic relationships between human agents and their respective personal assistant software agents; and Design Model, that refines the previous models and determines the most suitable agent architecture for each agent, and the requirements of the agent network. This research is funded in part by the Commission of the European Community under the ESPRIT Basic Research Project MIX. Modular Integration of Connectionist and Symbolic Processing in Knowledge Based Systems, ESPRIT-9119, and by the Spanish Government under the CICYT projects TIC91-0107 and TIC94-0139. This research was partly carried out while the first author was visiting the Dep. Ingeniería de Sistemas Telemáticos (Universidad Politécnica de Madrid).